Struggling to choose between the metro, taxi, Uber, or walking?! We’re here to help! 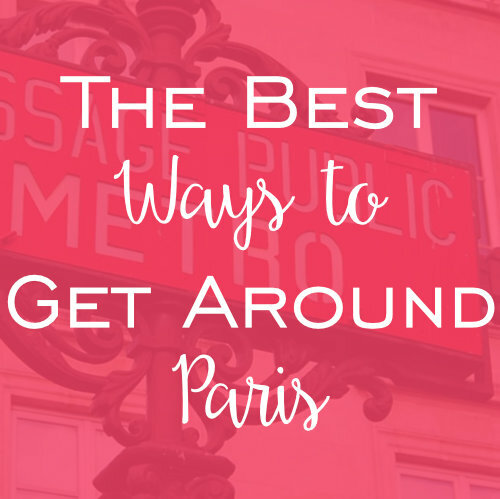 “What is the best way to get around Paris?” This is a question we are asked almost weekly! We decided that this topic deserves a blog to help clear things up. Keep reading, and help us help you choose which is the best option for you! The Paris metro is a fairly simple system to use, as the metro stations have signs everywhere to help you. It is very important to pick up a metro map (free) from the information booth of the first metro you use! Metro entrances (almost always descending below street level) are clearly marked, with a few different styles of signs. 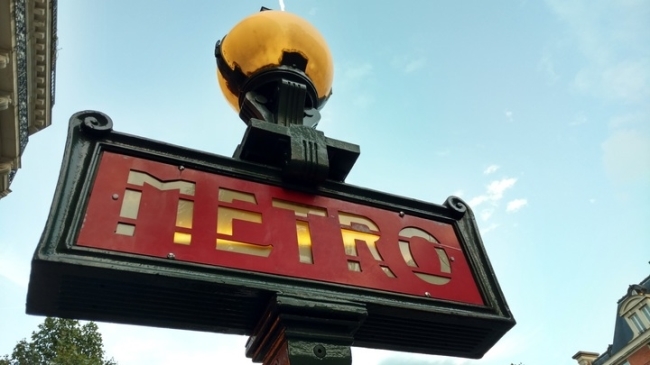 Sometimes you will just see a big yellow ‘M’ in a circle, other times you will see the art nouveau ‘Metropolitain’ signs, other times still you will see a red ‘Metro‘ sign like below. In any case, they are hard to miss. Buy a “carnet” of 10 metro tickets (‘t+’ tickets) for 14.10 euros and just use them as you go. Each ticket gives you a one-way ride to anywhere in Paris. Tickets purchased individually are 1.80 euros each. 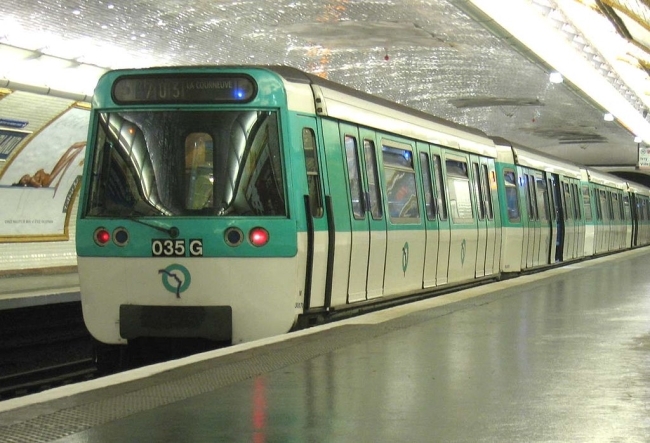 Getting a carnet of 10 tickets and using them as you go is likely to be a good option unless you are really pressed for time and think you will be using the metro more than several times per day. You can purchase your passes and carnets from ticket booths in any metro station. The metro and RER ticket machines are in English as well as French, so don’t worry about getting lost in translation here. Most metros will run every 2-5 minutes between 8am-8pm. As it gets later in the evening, less trains are operating on the line so they may come every 5-15 minutes. Last metros run around midnight or 12:30am on weekdays, 1:00 or 1:30am on weekends. 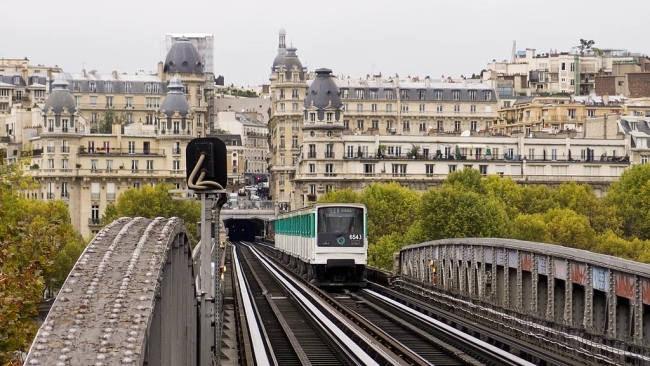 All in all, the Parisian metro system is easy, inexpensive, reliable, and fast. All of us here at the Sight Seeker’s Delight team use the metro daily, so for us, it’s really a no brainer as one of the best ways to get around the city! When you call for a taxi to come pick you up, that taxi’s meter starts running the minute you call – NOT the minute you hop into the cab. It is normal that the taxi will show up with 5-9 euros already on the meter. If you call for a taxi and you are told the taxi will arrive at a certain time, it is best to wait for the taxi outside. Even if the driver arrives earlier than the specified time, the meter will continue to run while they wait for you. Hailing one can be difficult because it is illegal for that taxi to pick you up if you are within 50 meters of a taxi stand or if they will have to pull over in the bus lane to get you. For these reasons we recommend going to a taxi stand. You will recognize a taxi stand by the blue and white sign. Many stands have a pillar and button you can press to alert taxis in the area that you are waiting at that stand. There are about 75 in the city, the main ones being at Chatelet, St. Michel, Eiffel Tower, Arc de Triomphe, Opera, Bastille, and Republique. If you do hail a taxi, you can know if it is occupied if the light is off or red. Available taxis have white or green lights on the top of the car. 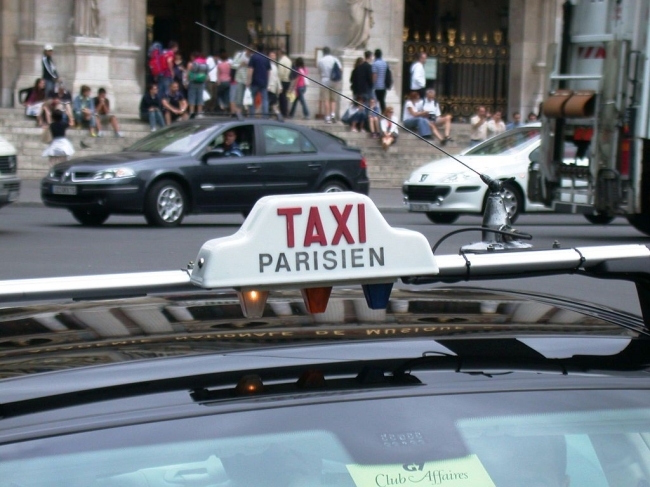 Many taxis (notably G7 and Taxis Bleus) will take payment by credit card if it is over 15 euro – but you must ask about this in advance. A 10% tip is normal if you have a helpful or courteous driver. The plus of an Uber, is you know that you won’t have any translation problems, and you know you won’t be getting ripped off by a crooked driver and get charged an outrageous fair. If your smartphone is functioning while you’re in Paris, I recommend using this service. Unfortunately, the Paris metro system is not always handicap friendly. The majority of stations have escalators and elevators that make it easier, but I find there is almost always a few steps that come into play. Taking a taxi or an Uber is your best bet if you have any mobility issues. We’re partial to walking, we are a walking tour company after all! When it’s not too cold (although, if you’re dressed appropriately, you’ll be fine! ), Paris is a very walkable city. Apart from the metro, walking is our mode of transportation here at SSD! There is so much in this city to be seen, that for us, it’s really a shame to miss out by being underground in the metro! 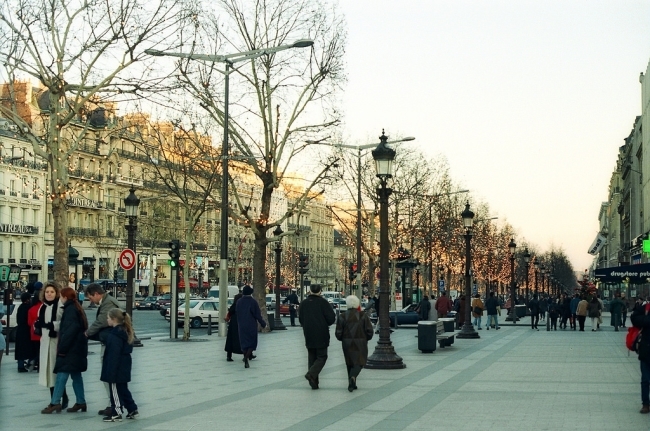 Walking will also help you get your bearings more in Paris than blindly following the metro. During my first few years here, I can’t tell you the amount of times I found myself in an area that I had no idea was so close to another. I remember the first time I discovered how close the Louvre and Place de la Concorde are to the Opera Garnier. I know what you’re thinking…look at a map! But honestly, when you get so used to jumping on the metro, it can be really easy to overlook things like this! Why not get your bearings, while hanging with us, and learning a lot?! Book our Paris Along the Seine tour for an excellent overview of the city, and snag 5€ off per person by using the discount code WALK! I hope that after reading this article, I was able to shine some more light on the best ways to get around Paris. Here are the options, and now the choice is yours! Did I miss any major forms of transportation? Would you be interested in learning more about biking in Paris, for example? Let me know in the comments below, we love hearing from our readers! Special thanks to Claire Thomas for her major part in writing this article. Claire worked and wrote for Sight Seeker’s Delight for 7 years – read more here. This entry was posted in Travel Tips and tagged metro, Paris, taxi, walking tours. Bookmark the permalink.